With all the talk of macros in the blogosphere yesterday, I got to doing some of my own research. 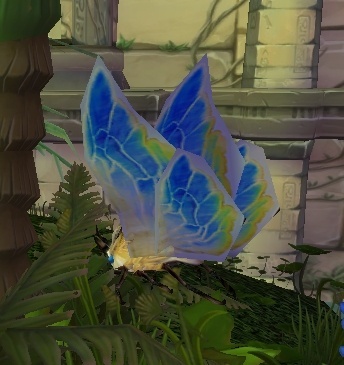 The night before, I ran through the Lost City dungeon and someone did the /love Oasis Moth emote for the Cata Squirrels achievement. In wrath, I had an emote macro (like this). How about this? A web interface to that table, a veritable WoW Armory Code Repository. Using the player info, they could break down macros by toon types (Warlock: Destro, Aff, Demo). Macros could be weighted by popularity, or commented on (add categories). You like one, have it assigned to your account (take up a free macro slot). Macro get's updated, you can have the option of accepting changes, or not. From a technical perspective, unfortunately, this wouldn't be that easy to implement. Allowing you to assign a global macro to your account would require another layer of abstraction, i.e. another table. Another table per user would likely mean your account would increase in size, loading and performance on the backend servers increased. OK, never mind. Global repository aside, I still would love to have a way to see everyone's macros. Yeah, I know about all those websites (wowmdb, wowwikiapedia, mmo-champion, etc.) have macro forum posts. I am thinking Codeplex (checkout RAWR on codeplex) for WoW macros, i.e. searchable, categorized, and commented on. Wow, that is a cool idea. You could run it almost like an open source with a check-in check-out editing protocol. Some sort of bug tracking. The SW engineering in me is geeking out right now. But yes, having done a similar thing in the industry before... lots of work. And, really, I tend to put a personal touch on each of my macros anyways: take away a mouseover here, add one there, etc. There is a high level of desired customization that would make this doubly hard. Yeah, I would have to agree with the customization factor. I've been going through the critter macro each time I find another one on that list. Helps stop the duplicate /love emotes. but it doesn't seem to have evolved that way. Too bad. It's still a cute little tool.